What a whirlwind we've had over the past few weeks! 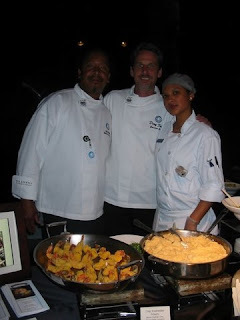 For the 3rd consecutive year, Lauren Farms was invited to the Cooking For Solutions event at the Monterey Bay Aquarium in Monterey, California. Co-sponsored by Bon Appetit, the 3-day event showcases the best of the best in sustainable foods and wines. The event is held throughout the breathtaking Aquarium, which is situated right on the sunny, rocky shores of the Pacific Ocean. 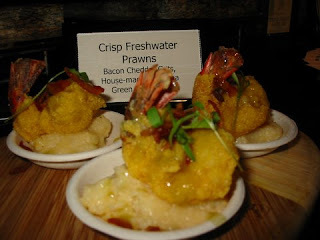 Over the course of the weekend, Freshwater Prawns were served to approximately 3,500 attendees, which included national media representatives, food enthusiasts and celebrity chefs. Thomas Keller and Alton Brown were just a few of the celebrities on hand for the event. We were very excited to be introduced to Regina Charboneau, a fellow Mississippian, who manages the Inn at Twin Oaks in Natchez, Miss. She prepared a wonderful U.S. Farm-Raised Catfish recipe. 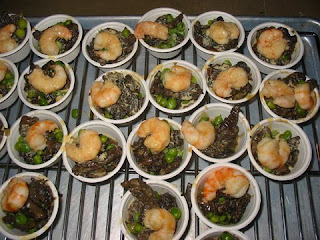 Two delicious Lauren Farms Freshwater Prawn dishes were prepared by celebrity chefs throughout the weekend. 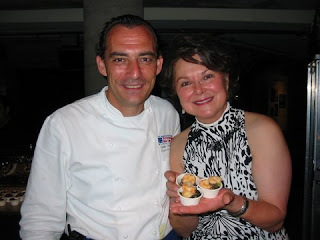 Chef Jeff Walker of Bon Appetit prepared a delicious dish (that was the hit of the night! ): Crisp Prawns with bacon cheddar grits and Louisiana hot sauce. 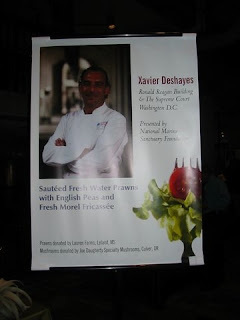 And during the Saturday night Gala, Chef Xavier DeShayes, head chef for the U.S. Supreme Court in D.C., prepared sauteed Freshwater Prawns with English peas and fresh Morel Fricassee. Delicious! 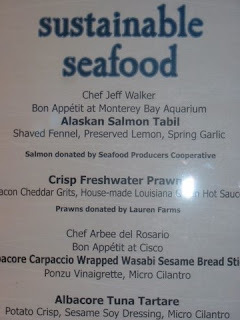 Lauren Farms is always very, very honored to be a part of Cooking for Solutions. It seems that the event keeps getting bigger and better, and every year, our freshwater prawns gain more supporters and followers. 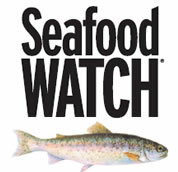 It's nice to be among those who are as passionate about sustainable aquaculture as Lauren Farms is. Plus, it's such a treat getting to visit a beautiful State like California - especially the Monterey and Carmel areas. We appreciate all of the hard work that goes into this event, and we are counting down the days until Cooking for Solutions 2010! This dish was amazing! Chef Walker did a great job and was so much fun to work with. 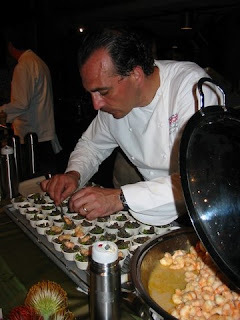 Chef Xavier prepared the Freshwater Prawns deliciously at the Gala on Saturday night! He was truly a celebrity - people were lining up just to meet him. Preparing the Freshwater Prawns for the dish. 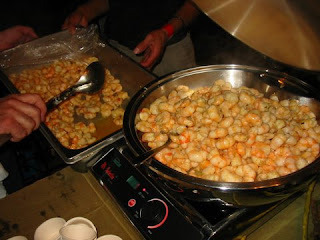 Adding the final and most important touch: the Freshwater Prawns! Chef Xavier and I with his tasty creation. The final product prepared for the Gala-goers.